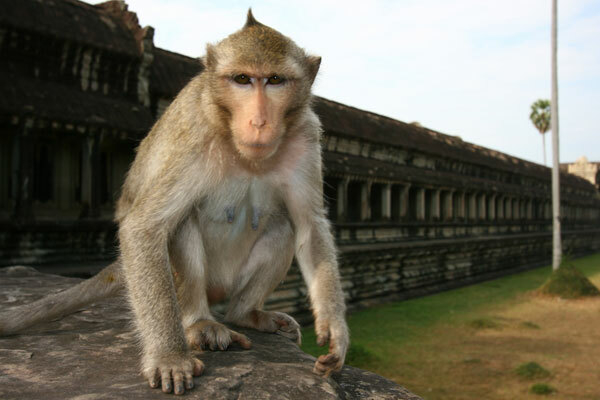 Beware the Monkeys of Angkor Wat! 24 Jul Beware the Monkeys of Angkor Wat! We successfully escaped the grasps of all the border scams crossing into Cambodia from Thailand! “Ma’am it’s more expensive at the border!” “Sir, it’s impossible to get your visa at the border. You must do it here.” “$20 US? Oh, no the price changed it’s now 1000 Baht. Take it from us, it is possible to cross the border into Cambodia and get a visa upon arrival for $20US.” The scam is not at the border, it’s before you even arrive! After a 24 hour bus ride from Chiang Mai in northern Thailand, we arrived in Siem Reap, Cambodia. 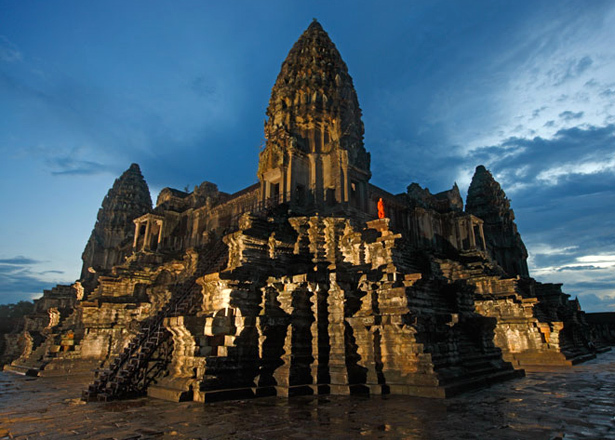 A city visited by tourists around the world who come to marvel at the ancient, stunning ruins of Angkor. Built through the 9th-13th century, the wonder of Angkor still stands as a testament to the strength and resilience of the Khmer people. The Khmer Empire dominated the Southeast Asian region from the 9 to 13th century, ruling what is today Thailand, Laos and Vietnam. The array of temples were constructed by the various kings during their reign in honor of Hinduism. However, as the religion of Buddhism swept through the region the temples transitioned with faces of the Buddha taking over. A real source of national pride, the symbol of Angkor Wat is everywhere you look in Cambodia – on the Cambodian flag, their money and, perhaps most importantly, on their beer! Favorites of the day were the infamous Angkor Wat, of course, but in tight competition with Ta Phrom with its battle against the trees taking over its structure, as well as Bayon with its 216 smiling Buddha faces staring off into each cardinal direction. Other than border scams, you must also be careful of robbery. Sadly, one of our participants was robbed but thankfully, all the sneaky culprit managed to get was her beautiful purple scarf. He was about two feet tall, hairy, grey and had a long tail. We’ve said it before, and we will say it again: monkeys are not your friends! Photo credit: National Geographic and ContemporaryNomad.com.